Umbrella organization of French Jewish groups condemns Paris attacks, issues new safety instructions to synagogues. 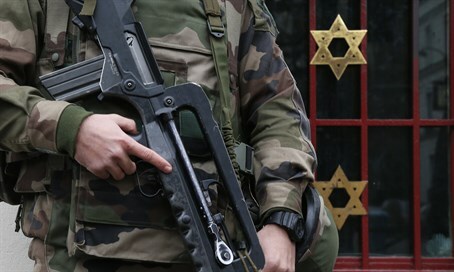 French soldiers guard a Jewish institution in western Paris. In the wake of the deadly Islamic State attacks in Paris, the umbrella organization of French Jewish groups has called for a "merciless war" against radical Islam. “The global war against the monstrosity of jihadist fanaticism must become an absolute priority of democratic nations,” the Representative Council of French Jewish Institutions (CRIF) wrote on Twitter. “We must fight it without mercy, without relenting, in order to vanquish it." In another statement, CRIF said it shared the "extreme mourning of the nation" and offered "its most saddened condolences" to the families of the victims. While CRIF President Roger Cukierman told JTA he was not aware of a plan to specifically target Jews in the attacks, SPCJ, the Jewish community's secret service, wrote there were "very serious concerns" among French Jews. In response, SPCJ posted a list of security instructions for Jewish community leaders on its Facebook page. One new directive was to “make sure all congregants are aware of any cancellation” of services, to prevent lingering outside synagogues, "thereby putting them at even greater risk." SPCJ also noted that because the attacks point to detailed reconnaissance by the terrorists, Jewish organizations and synagogue in France must begin "breaking up [their] routine."